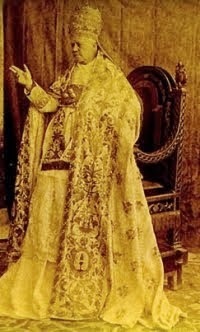 Pope Pius XI instituted the Feast of Christ the King against 'Liberalism;' Liberalism is precisely a form of cowardice. Liberalism denies the Kingship of Christ, His power by right over human society. This current Christian heresy is complicated..Liberalism eliminated the Kingship of Christ by saying something [ostensibly] 'innocent': that religion was a private matter, and therefore nations should respect all religions and the Church should not get involved in things that don't concern her--in other words, in public affairs. However, the great German philosopher Josef Pieper observes that if we make God a private matter (a matter within the conscience of each person), by the same token we convert the State into God; and we turn Jesus Christ and the Eternal Father into sub-gods. Indeed, this means that because the State is a public affair, religion would therefore be inferior to it and would have to submit to the State, since what is public is far superior to what is private and the private must submit to it. In fact, history soon showed that 'liberal secularism', or supposed neutrality regarding religion, was n reality true hostility; and it ended up deifying and divinizing the State." (Leonardo Castellani, DominguerasPrédicas, pg. 327). There are many spiritual dangers that abound in the world today. Indeed there are so many that at times it feels like one is walking through a mine-field. Perhaps this is an appropriate image to use; after all, the Church Militant is engaged in a real war "against principalities and power, against the rulers of the world of this darkness, against the spirits of wickedness in the high places" (Eph. 6:12). In this war there can be no neutrality, no compromise, no quarter given and none received. Falsehoods must be destroyed by the light of truth, and sin by the power of holiness. There is no other way, and our eternal salvation is on the line. So yes, dangers abound. Materialism. Atheism. Modernism. The sexual "revolution". Indifferentism. Every -ism that has ever reared its demonic head against the authority of God and His Church. 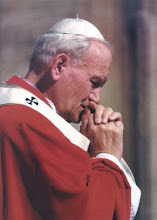 The Church, of course, stands firm upon the promise of Christ, "the gates of hell shall not prevail against it" (Matt. 16:18). 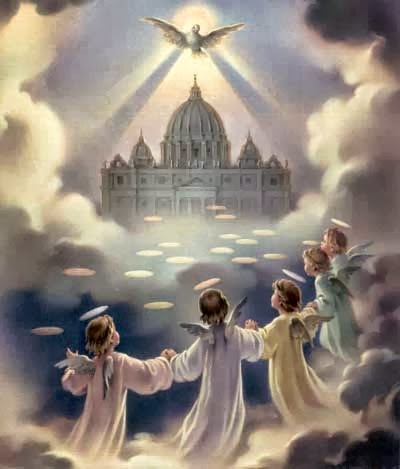 This promise is perpetuated and guaranteed by the special grace of infallibility granted to the successors of St. Peter, by which we understand that the Catholic Church, united under Peter and his successors, will never teach error. This guarantee is from Christ Himself, ratified in heaven by God the Father and upheld by the power of the Holy Ghost. Therefore, we can rest easy, correct? Since Peter's successors will never fail, and since the Church will never teach error, we have no reason for concern about any of the troubling news coming from various quarters of the Church today, right? Everything we see going on around us is just par for the course, isn't it? My friends, if we think so, we gravely delude ourselves. Yes, dangers abound. But these -isms are not the primary danger. The Church is guaranteed that she will never be ultimately teach these errors as truth. The real danger is not that the Church will teach error as truth, but rather, that the Church will tolerate error and allow deviations from Catholic discipline because it feels like it can't stop them anyway. Thus, the teaching will remain "on the books", so to speak, but like obsolete laws in many American states that ban drinking on Sundays but have not been enforced for decades, the teaching of the Church will remain a dead letter while aberrations and dissent will be accepted as the norm. (1) Homosexual Relationships: We have already seen plenty of examples of this. Without changing or denying Church teaching, some have stated that active homosexuals should be welcomed in the Catholic Church and even encouraged to participate in parish ministries. The Church does not approve of their sinful lifestyle, but nobody should ever act as if this is the case. This is seen to be an appropriate "pastoral response" to the "actual circumstance" or homosexual couples seeking to get engaged in parish life without renouncing their sin. Thus, the formal condemnation of such behavior is rendered meaningless by a refusal to act as if this condemnation means anything practically. We call to mind for our readers the example of Cardinal Schoenborn, who in 2012 overruled one of his parish priests and permitted a man in an active homosexual "domestic partnership" to serve on parish council. (2) Divorce and Remarried Reception of Communion: The Church's position on the intrinsic impossibility of divorce and consequent sinfulness of any putative "remarriage" is well known. Because a putative "remarriage" is nothing other than adultery, those living in such unions are in an objectively sinful state and cannot receive Holy Communion. However, given the very, very large number of Catholics living in this state, it means many Catholics are barred from receiving Holy Communion. This may cause them to become "discouraged" and "leave the Church" (nevermind that a person who persists in a state of objective sin has already left the Church in their heart). Therefore, to keep them at least showing up to Mass, pastors should grant exceptions to this rule when "particular circumstances" demand it. Consider the teaching of Prof. Paul Zulehner, theologian and professor emeritus for Pastoral Theology at the University of Vienna. 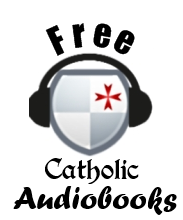 In an opinion published in 2010, he stated, "In principle the church bars divorced and remarried Catholics from the reception of communion, but in concrete situations it can and should act pastorally, like a caring head of a household." 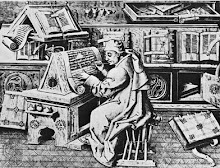 He then went on to cite a pastoral letter of the Austrian bishops, which states, "“According to the traditional practice of the church, they cannot participate in the full sacramental life, except when there are special circumstances that in each individual case will need to be clarified further in a conversation with an experienced priest.” So, "in principle" nothing has changed, but in actuality, anyone who can claim "special circumstances" in "concrete situations" may convince the priest to "act pastorally" by giving them Holy Communion despite Church teaching! (3) Cohabiting Catholics: This is so common as to not need much comment. Catholics who are cohabiting are seldom challenged from the pulpit. Catholics who are cohabiting and present themselves for marriage are given a pass, if the priest even bothers to inquire about their living arrangements. With Bishops pressuring parish priests about falling "numbers" of weddings and baptisms performed, many priests are fearful of causing a problem in the Diocese and choose to look the other way and marry cohabiting couples rather than risk causing a breach which may lead them to marry in a Protestant Church or before a judge. Thus, while the official teaching has not changed, the Church's condemnation of cohabitation comes to mean absolutely nothing in the practical sense. (1) Prioritizing keeping these people physically coming to Mass at all costs, based on an unhealthy focus on the "numbers" of people attending Mass and receiving sacraments. (2) A disassociation of doctrine from the practical moral consequents that necessarily flow from that doctrine. (3) A misguided notion of bringing order to the Church by means simply approving abuses; legalizing or at least sanctioning illegal acts "restores order." (4) A definition of "pastoral" that means keeping people feeling good about the Catholic Church, as opposed to the traditional notion of "pastoral" as meaning leading people to eternal salvation. "Some priests sincerely feel they are acting out of compassion for the cohabiting couple, knowing how difficult it might be to challenge them to live apart. Compromising the full truth of the Bible, however, is really a disservice because Jesus teaches that the truth will set us free no matter how difficult the sacrifice may be." "If the answer to the question asked above is "No, we choose to not separate before marriage," then further considerations must be made. If the couple has shown that they are living together for the reason of convenience or financial benefit, and the engaged couple is planning a formal marriage, then the priest will explore with the couple on a deeper level the meaning of the sacrament in the marital bond and the commitment to permanence and stability." It is unfortunate that the document does not simply say, "If they refuse to separate, then they cannot be married in the Church." The problem of pleading "pastoral applications in concrete circumstances" as a means of avoiding the unpleasant implications of doctrine is another wonderful example of modern teachings proclaimed "ex voce", in other words, teachings we are meant to imbibe by a kind of unofficial osmosis; teachings not communicated through official, authoritative channels, but nevertheless truly communicated in low-level pronouncements, in the manner in which bishops act and what they choose to emphasize, and to the pastoral actions priests take (or do not take) when confronted with these situations. It is a subtle way to communicate new approaches to theology and morality without formally changing anything. Nothing has changed, but everything has changed. 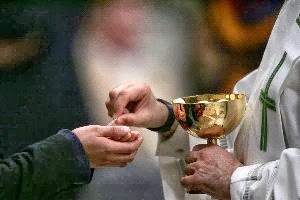 In a 1994 document on the question of communion for divorce and remarried Catholics, Cardinal Ratzinger stated that "authentic understanding and genuine mercy are never separated from the truth" (source). Discipline, though logically distinct from doctrine, is nevertheless intimately related to doctrine and flows from it. As the world slides further and further into chaos, and as humanity continues to throw off all moral restraint, will we respond by insisting ever more firmly on the Church's morality and challenge Catholics to exemplify it, or will we respond the same way we responded to female altar servers and communion in the hand, by "baptizing" the abuse and calling it a day? "Pastoral applications in concrete situations." Be on guard. This Sunday our Holy Father Pope Francis will consecrate the world to the Immaculate Heart of Mary. Of course, there are no plans to mention Russia specifically, and the bishops of the world have not been asked to participate. 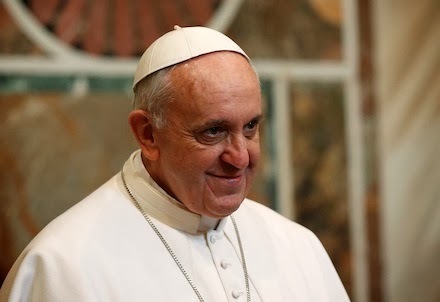 It looks as if our current pontiff will be continuing in the trajectory set by previous pontiffs of performing generic world consecrations that do not fulfill Our Lady's request at Fatima. This is a profoundly disappointing development, especially since with Francis' current popularity, such a consecration of Russia specifically, and in union with the bishops, would most likely be well received by the faithful and the hierarchy, the former of whom have expressed on more than one occasion their willingness to participate in a consecration of Russia when and if the Holy Father should wish to do it. And what is the point of a consecration of "the world"? To consecrate something means to set it apart, dedicated to the service of God. Now, "the world" is really everything. How can you set apart everything? What is it being set apart from? Perhaps I am being a little simplistic here, and I will willingly receive correction on this point, but to consecrate the whole world seems like playing a game where everybody wins. And if everybody wins, then nobody does; if everything is consecrated, is anything consecrated? And if the entire planet is to be consecrated, why the necessity of repeating this consecration again and again over the past sixty years? Each subsequent consecration suggests and imperfection in the previous one; unless we take the position that consecrations periodically need to be renewed. Who knows. The consistent failure of the last several popes to consecrate Russia to the Immaculate Heart is one of the most disappointing aspects of modern Catholicism, and it does not look like it is going to happen anytime soon, although our Lady did state that it would finally happen, but "late." I am not one of those people who attributes every single ill in the world and the Church to the failure of the popes to consecrate Russia, but the way things are going, it is very difficult to not see a correlation between the darkness the Church suffers through and the ongoing failure to make the consecration. On a positive note, I do know through several reliable sources that Fr. Gruner is in the Vatican this week, and that allegedly he will be meeting with Pope Francis prior to the consecration. It is known that Pope Francis, as Cardinal Bergoglio, had written to Fr. Gruner in the past. I do not know the nature of their meeting this week, but I pray it will be fruitful. These are very strange times, my friends. I usually don't post with an aim towards addressing issues of a purely local interest, but I think today's post can be beneficial to a broader audience, especially anyone who has ever had to deal with the problems arising from lack of discipline with regards to private apparitions or the veneration of unapproved local "saints." In Plymouth, MI., which is practically my own backyard, there has been a little controversy going on over a young girl who died of a brain tumor last year. This girl was 9 years old at the time of her death and had battled cancer courageously for a long time. Sure enough, shortly after her death, the young girl was being venerated as if her sanctity were beyond doubt. Many Catholics locally are praying to her, and relics of her are even being circulated, all of course without the permission of the local Ordinary. She even has a title she is being invoked under; "Bridget the Brave." First of all, condolences to the family on the tragic loss of their beloved daughter. Losing a child is terrible, and while I do not know the pain first hand, I have known several people who have lost children and I offer my sincerest prayers and affections to the family. It is not my purpose in this post to address any questions about the person of young Bridget or her sanctity, but rather to address the question of the appropriateness of the veneration being offered to her so soon after her death. I do not do this on my own initiative, but on behalf of those who have consistently asked about the propriety offering this sort of veneration to somebody who has no official cultus recognized by the Church. In fact, I have had multiple inquiries just in the past 30 days on this case. I don't know who is perpetuating the cult of Bridget the Brave, or to what degree the family is involved or how widespread it is, but it must be substantial based on the sorts of inquiries and reports I have been getting. For example, a friend of mine was recently in a car accident, and some local Catholics showed up offering relics of Bridget the Brave to be kept by the girl's hospital bedside. The simple question that keeps coming up is this: What degree of public veneration is appropriate for a dead individual without any public recognition from the Church? The correct answer is none. It is certainly true that a saint does not need to be canonized to have a public cultus. 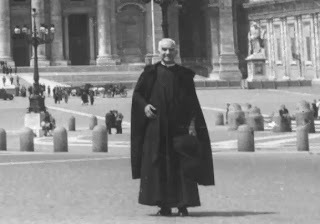 In fact, the recognition of an existing cultus is one of the criteria for beatification and canonization; it is a recognition by the Magisterium that a cult of veneration to that individual already exists and that the faithful have already recognized their sanctity. Thus, it might seem counter intuitive to suggest that no public cultus can exist without some sort of formal recognition, when in fact the existence of a public cult is a prerequisite for ecclesiastical recognition. Is this not a contradiction? What we must keep in mind is that a public cultus is called into being by the local Ordinary. This is done by the Bishop formally asking the Congregation for the Causes of Saints to open a cause for the saint. Once the Congregation accepts the petition of the bishop and opens the cause, the individual receives the title "Servant of God." This is the "documentary" phase of the process, when the Congregation is busy looking over the life and doctrine of the candidate. 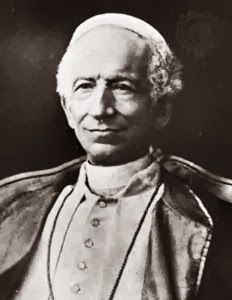 "Any solemn celebrations or panegyric speeches about Servants of God whose sanctity of life is still being legitimately examined are prohibited in Churches. 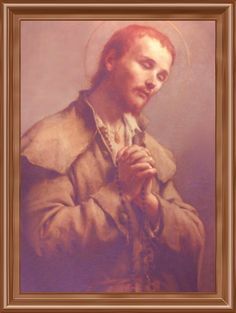 Furthermore, one must also refrain, even outside of Church, from any acts which could mislead the faithful into thinking that the inquiry conducted by the Bishop into the life of the Servant of God and his virtues or martyrdom carries with it the certitude that the Servant of God will be one day canonized." 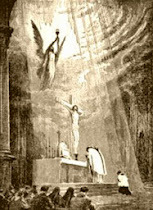 While obviously liturgical celebrations and homilies about the Servant are forbidden, the instruction declares that "even outside of Church", any actions are prohibited which might mislead the faithful into thinking the Servant's sanctity was already declared or that their canonization is inevitable. This would preclude publicly offering the Servant titles like "Bridget the Brave", encouraging groups or individuals to ask for her intercession, and especially things like passing around alleged relics. 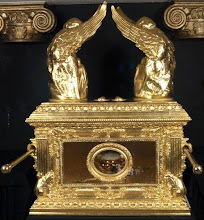 In fact, the Code of Canon Law 1187, which addresses veneration of relics and images, states that no relic can be publicly venerated unless that individual has been officially recognized by the Church as at least a blessed. Passing relics around and distributing them in hospitals and calling them "relics" does constitute public veneration, in my opinion at least. Please note this is not even appropriate activity for one who has been deemed a Servant of God. Bridget has not even been declared a Servant of God by the Congregation of Causes for Saints. In fact, the local Ordinary (Archbishop Vigneron of Detroit) has not even submitted a report to the Congregation yet; in fact, the Ordinary has not given any sort of recognition to the cultus of Bridget whatsoever. All that has happened so far is the family has consulted the parish priest about trying to get a cause established and some documentation has been collected. If the above mentioned activities are not appropriate for a Servant of God, it should be beyond doubt that they are not appropriate for someone of Bridget's status. It is evident that there is nothing even remotely close to an officially recognized public cultus. Therefore, what sort of veneration is appropriate? If those who knew this girl want to promote her sainthood, the thing to do is to collect evidence of her sanctity, spread the word about her heroism, pray for the public recognition of her sanctity, and petition the local Ordinary to ask the Congregation to open a cause. But remember that the Congregation does not have to open a cause, and that there is no absolute certitude Bridget the Brave is currently in heaven, or that she exhibited heroic virtue in life. Therefore, public or private prayers addressed to Bridget the Brave are not appropriate; nor is it appropriate to pass "relics" of this young girl around as if her sanctity were already self-evident. It is for the Congregation to decide on her sanctity, not the laity at large. 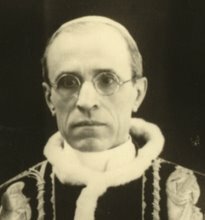 We must keep in mind the decree of Pope Alexander III (1173), who, when he heard a bishop was allowing veneration of a man who had not been formally approved by the Church, declared, "You shall not therefore presume to honor him in the future; for, even if miracles were worked through him, it is not lawful for you to venerate him as a saint without the authority of the Catholic Church." (Lambertini, De Servorum Dei, "On Heroic Virtues", c. 1:21 and Gregory IX, Decretales, III, "De reliquiis et veneratione sanctorum"). We applaud the pious wishes of the folks involved in this case to promote an heroic example of Christian suffering and holiness. But all things must be done in proper order, and to publicly invoke the girl as if her sanctity were already beyond doubt and pass around relics are not appropriate actions at this point. If this sweet girl truly is a saint, may the Church recognize her sainthood! But we must wait on the Church before presuming to offer her the sort of veneration that can only come with the approbation of the Church. And in the meantime, as we wait for that day to come, continue to pray for Bridget. For more information on the scrutiny that is meant to go into a canonization process, please see this article on the history of canonizations with relation to the office of the Devil's Advocate.